Insulation provides people living in houses, apartments, and other structures with increased comfort, reduced risks of serious injury caused by excessive heat or cold, lower recurring bills, and a generally positive impact on the environment. According to Energy Star, a bureau of the United States government dedicated to conserving natural gas, water, and electricity usage throughout the nation, a typical American home can save up to 20 percent on annual utility bills with proper wall and attic insulation installation and can further improve that through sealing air leaks and having radiant barrier installed properly. What Does Properly Installed Insulation Do, Exactly? A major function of shelter is to keep us warm during cold, winter months; likewise, it serves to maintain cool temperatures throughout stifling, summer months. The reason shelter, especially modern homes, is so effective at segregating temperatures is because of walls, floors, ceilings – everything in between the outdoors and homes’ actual living spaces. Hot and cold air will always attempt to reach equilibrium, a point at which two given volumes of air that initially featured a temperature difference will have equal temperature. Without insulation, air creeps its way through small crevices between walls, around windows, where homes’ foundations meet the ground, through underused attics, and everywhere else in between. Insulation helps slow down the transfer of hot and cold bodies of gas – in this case air both inside and outside of homes – which places less strain on central heating and cooling systems. Why Is The Installation Of Insulation So Tricky To Perform Correctly? 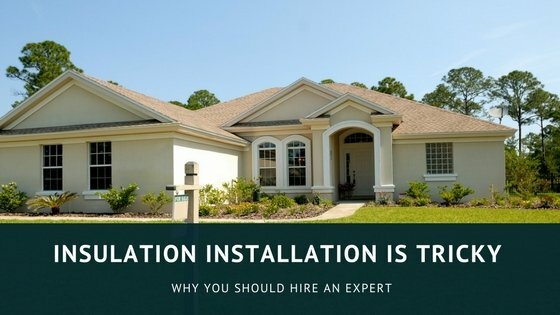 There are tons of solid reasons explaining why homeowners should always seek out insulation installers, unless those same homeowners are professional, full-time insulation installers. If you’re currently skeptical about the need to hire an insulation-installing professional, you won’t be in, give or take, four minutes. Trust us! Take it from the experts. Fiberglass is made up of many fibers, or tiny particles that are three times their width in length, at minimum. The compound – it’s commonly called glass wool or fibrous glass – is loaded with tiny glass fibers, the primary substance that forms fibers in the compound. The tiniest pieces of fiberglass can travel into the lungs, where the substance causes some serious problems include painfully itchy skin from skin contact; red, irritated eyes; harshly agitated nose and throat areas, potentially causing bronchitis or asthma; another known short-term health affect of fiberglass exposure is irritation of the stomach lining. In rare instances, some people develop long term medical issues related to fiberglass exposure. Unless you’re willing to take on the potential of well-documented health risks, consider hiring attic insulation installers. Cellulose is known to be the world’s longest-used insulator, having been used for thousands of years. Today, it’s essentially made of old newspapers covered with flame-retardant chemicals. Historically it was created with cotton, hemp, straw, sawdust, and other natural insulators. Although the fiberglass alternative is leaps and bounds safer than glass wool, it sinks to the ground over time, leaving large gaps between the top-most portions of walls and the eventual tops of cellulose insulation. This results in lower energy efficiency than when other options are chosen. Further, cellulose is an excellent source for mold to grow if moisture is allowed to reach the insulation. Although vapor barriers can effectively keep out mold, at least in most situations, ripped, torn, or completely absent plastic vapor barriers can cause big problems – mold isn’t fun to deal with, can cause severe allergic and asthmatic reactions, and even permanently damage surfaces affected by mold and its close relative mildew. Attics are typically less insulated than any other parts of homes, as homeowners spend less time in them than any other room in their houses and it often goes overlooked. Additionally construction companies sometimes install only the minimum required insulation which means that it may not be as efficient as possible. Homes’ uppermost levels need to consist of an attic radiant barrier. Unfortunately for homeowners, they’re often installed incorrectly. To install radiant barriers the right way, it’s important to leave at least a one-inch gap between the innermost layer of the roof and the radiant barrier itself. Laying such metal barriers directly underneath shingles can actually cause houses to be hotter. This is just one example of the subtle nuances that a homeowner may not know of, but where a professional insulation installation company is well experienced. Even if the home stays roughly the same temperature after radiant barriers are installed incorrectly, purchasing and installing them incorrectly is still a total waste of money. Attics are often filled with electrical lines, lights, and other sources of electricity. When cellulose – even if it’s been treated with chemicals to ward off fire – or fiberglass is exposed to electricity, that could result in a potentially life-threatening fire. Having your insulation evaluated by a professional company will help identify any potential hazards. Even if the insulation and wiring was initially installed correctly, it can be damaged and moved by pests or people storing things in the attic. This can cause insulation to become a hazard to your home and the safety of your family. Additionally having a professional insulation inspection done can identify areas where insulation has settled or had moisture damage due to leakage in the roof. Having an inspection done by an insulation professional can save you money and identify potential problems before they cause expensive damage to your home.